Posted by pacejmiller in Book Reviews, Reviews. 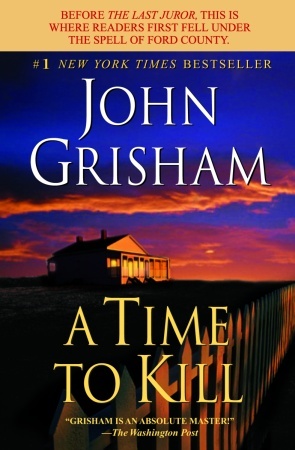 I’ve always been interested in the massive global phenomenon that is Mr John Grisham, and despite my disappointment with The Associate and relative disappointment with The Firm, I decided to check out Grisham’s first novel, A Time to Kill. Grisham names the novel as one of his favourites, and most people have told me it’s one of his best. And I think it has one heck of a premise — a young black girl is brutally raped by two racist rednecks, the girl’s father seeks retribution, and a predominantly white Mississippi community deals with its aftermath. Caught in the middle is a young, brash criminal defense lawyer by the name of Jake Brigance (a character Grisham admits was modelled on himself). Lots of stuff happens in this book, which is ultimately a courtroom drama/thriller centred around this very provocative premise. Would you do the same thing if it happened to your child? Would the jury convict? Would you vote to convict if you were on the jury? Those are the types of questions Grisham keeps asking throughout the story. Grisham paints the fictional town of Clanton (also used in a later book, The Last Juror) extremely well. There is a whole cast of characters, with almost a couple being introduced every chapter, and many of them are memorable and well-developed, especially the town sheriff Ozzie, the trial judge Noose, the obnoxious DA Buckley and Jake’s mentor Lucien. A number of minor characters also have their moments. A Time to Kill is a very good read, but not a great one. The opening chapters sucked me into the world of the story but every now and then throughout the 500+ pages there were times when I lost interest in the narrative. The strengths are the characters (good to see Jake Brigance has his own agenda and isn’t acting out of the kindness of his heart) and the moments of tension — either from the trial itself or the occasional threat of physical danger. However, as Grisham admitted himself in the book’s introduction, he does waffle on far too much about things that didn’t need to be. Like many first novels, A Time to Kill could have been pared back a lot more to speed up the pace, especially considering that the actual trial itself does not commence until almost four-fifths of the way through the book. I felt some parts could have been condensed (the pointless, sometimes repetitive chatter) while others (such as the trial testimonies and jury deliberations) could have been drawn out more. It’s a shame because with better plotting and pacing it could have been unputdownable. As for the moral debate in the book — I had to keep reminding myself that it was originally published in 1989 and that a small, predominantly white town in Mississippi where the KKK still roamed is a completely different world to the one I know. With that in mind I think Grisham handled it rather well. Ultimately, A Time to Kill is the best Grisham fiction novel I’ve read thus far, but it still fell short of the lofty expectations I had for it, given its reputation and the premise. Now, which Grisham book should I tackle next? PS: I first had a look at A Time to Kill when I was in a Border’s book store (back when they still existed in Australia) and read the author’s introduction, where Grisham discusses his fondness of his debut novel. It took him three years to complete it while still working as a lawyer (an amazing feat in itself), but didn’t gain success until The Firm became a bestseller. It’s an inspirational story I continue to use to push myself down the writer’s path. PPS: I can’t believe I still haven’t seen the 1996 movie based on the book. Might be my Matthew McConaughey aversion. I’ll have to check it out. you know, this was the first grisham book i read, and it’s the only one i’ve ever re-read. particularly the beginning.